The Potatoland Special certainly had a catchy name although that wasn't the intent behind its naming by the Bangor & Aroostook (the designation referred to the importance of the potato crop for both the state and railroad). The train was the BAR's only overnight streamliner, providing an impressive level of services running the length of the railroad's system between Bangor, Maine and the New Brunswick border at Van Buren. For nearly three decades the Special provided travelers a connection with the Maine Central at Bangor Union Station to the state's lonely northern reaches. After the BAR lost through service south of Bangor in the early 1960s, and with patronage already in steep decline by that time, the railroad ended all remaining passenger operations. The Bangor & Aroostook isn't a road one would tend to associate with streamliners and gleaming, colorful consists. The BAR (its official reporting marks to avoid confusion with the similarly named Boston & Albany) dates back to the late 19th century and eventually grew to serve much of northern Maine with southern connections reaching Bangor and Searsport along the coast. Its primary traffic consisted of agriculture (notably potatoes) and wood products (paper, pulpwood, timber, etc.) along with some coal. 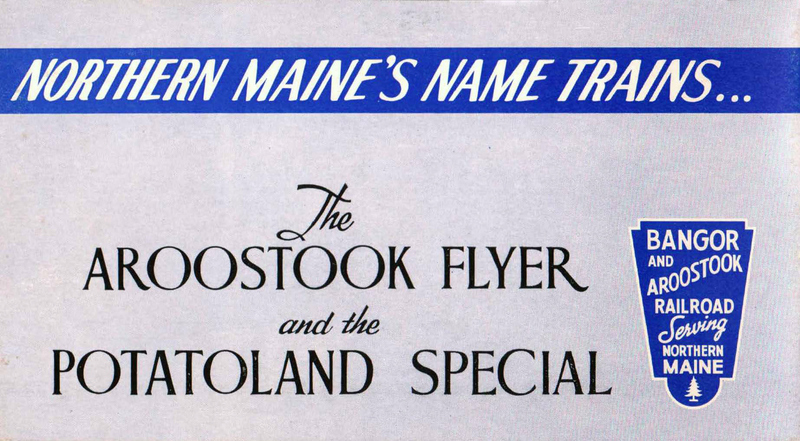 The BAR's two notable passenger trains included the Aroostook Flyer and Potatoland Special, the former being a dayliner that ran the 230-mile corridor in about 6 1/2 hours. Both trains were launched in the late 1930s and originally steam powered led by older 4-6-0 Ten-wheelers as well as more powerful 4-6-2 Pacifics. One early promotional piece featuring the trains stated, "Announcing! The new Aroostook Flyer. Completely New! 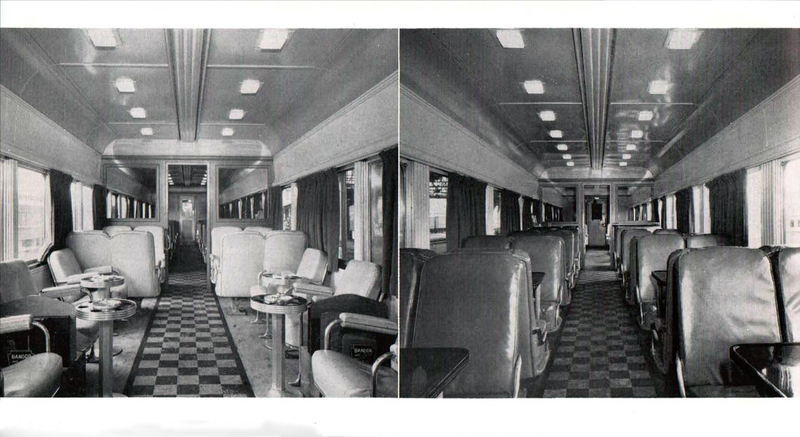 Air-conditioned, streamlined deluxe coaches, buffet-lounge car (no extra fare), fast day service between Van Buren and Boston via Aroostook Flyer and streamlined Flying Yankee." Of course, at this time lightweight equipment was not in use but that changed in 1949 when three new streamlined, coaches arrived from Pullman-Standard for the Flyer. These cars had cost $108,000 a piece according to Kevin Holland's book, "Passenger Trains Of Northern New England, In The Streamline Era," and brought a complete makeover to the BAR's operations. This was particularly true when the trio was mated with one of the new F3A (two, #506A-507A [later numbered to 46-47], were equipped with boilers for passenger service) or E7A (#700-701) diesels purchased between 1948-1949, which completed the streamlined look. 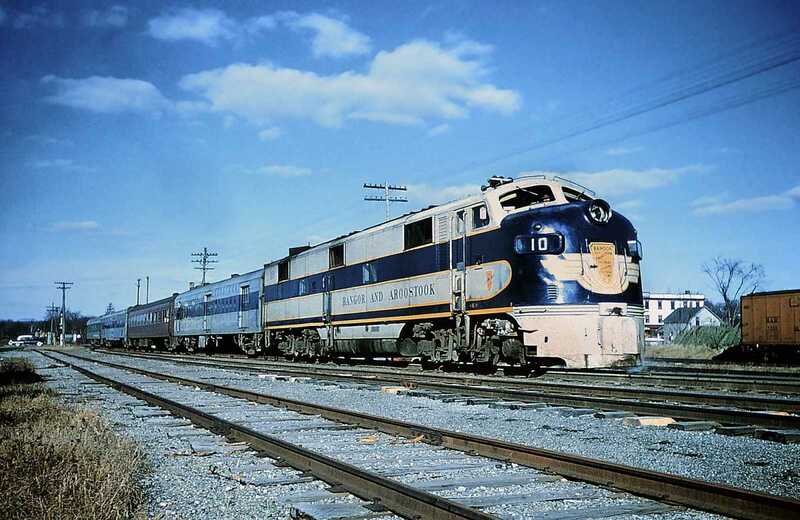 While the cars were clad in stainless-steel wearing a large, centered blue band the locomotives featured a beautiful livery of blue and gray with yellow trim. On the nose they sported a large winged emblem with the company logo "Serving Northern Maine" proudly displayed. According to Mr. Holland's book this scheme was very similar to the Electro-Motive's F3A demonstrator paint of 1945 while the winged look brought back visions of the Missouri Pacific's original Eagle streamliner of 1939. 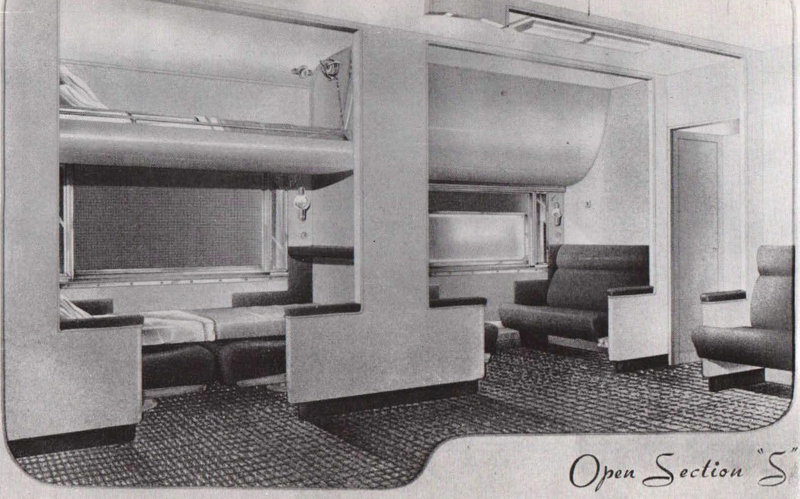 In 1953 the BAR returned to Pullman, this time for two 6-section/4-bedroom/6-roomette sleepers which were delivered in late 1954. These cars were named and numbered; 80, North Twin Lake, and 81, South Twin Lake. 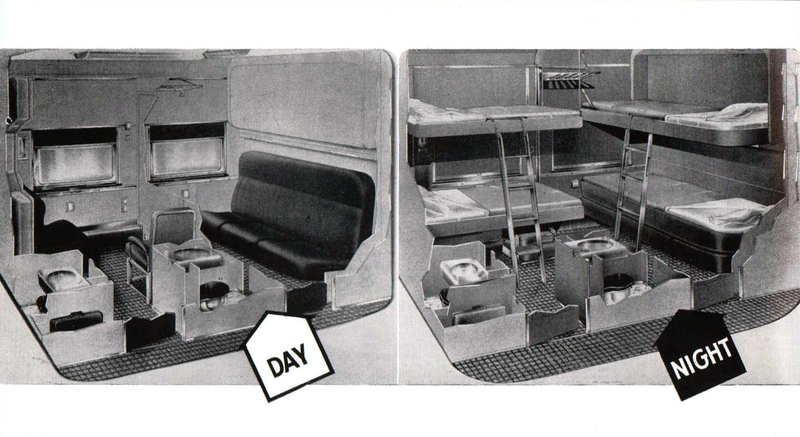 A brochure describing the cars and their services notes the following, "The bedrooms are arranged so that a sliding partition between two may be removed to make a bedroom suite, which is comparable to and more comfortable than Drawing Room accommodations. All berths have the latest foam rubber mattresses for restful sleeping. In addition to the physical comforts and conveniences, Pullman employees, proud of their art of serving, are in attendance at all times." The new sleepers ran in opposite directions of one another supplementing a streamlined coach and buffet-lounge within the Potatoland Special's consist. The train provided six-days-a-week service and was especially tailored towards business travelers, offering a connection to Boston's North Station over the Maine Central/Boston & Maine via Bangor normally running within the Gull's consist. The northbound Special, train #1, left Bangor Union Station early in the morning and arrived in Van Buren just after noon that same day. Its southbound counterpart, train #8, departed Van Buren in mid-afternoon and arrived back in Bangor late in the evening. As fate would have it the Special had a very short career. In early September of 1960 the MEC discontinued remaining passenger operations, leaving the BAR with no southbound outlet. As a result the railroad canceled its remaining trains in early 1961 (its two E7As were subsequently re-geared and used in freight service).